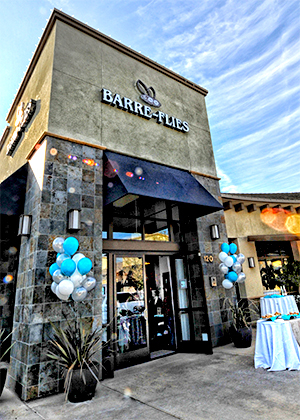 Located at Quarry Ponds Town Center, Granite Bay. We specialize in toning and elongating bodies. All bodies are welcome in our studio. We take the most effective elements of ballet barre work, mat based Pilates, and sculpting exercises, blend them together and BAM! BARRE-FLIES is born! In only an hour, we will work on all aspects of your physique, head to toe. In each exercise, your “core” is the foundation. You will carefully and safely flow from one exercise to another, followed by an opposing stretch series for each group of muscles worked, allowing for maximum flexibility. Proper alignment and positioning is something we are always working on with each and every client..
Download our app to your smartphone from the appstore and check class times and sign up for classes on the go!